The new webpack options in the cloudscribe Project template requires some additional tooling including NodeJs and Npm. If you don't already know about our project template, please see the introduction. You need to install NodeJs and Npm, you can can get the latest LTS version from their website. The windows installer for Node will install both Node and Npm. 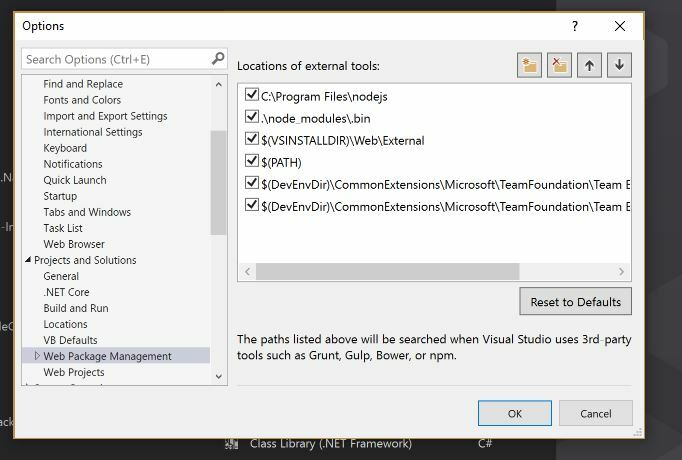 You should also install the Npm Task Runner extension for Visual Studio which lets you run npm tasks manually from Task Runner Explorer in Visual Studio. The cloudscribe webpack setup has 2 commands build and build-production which are commands that run webpack against our webpack,config.js file and against our webpack.production.config.js file. The .csproj file of the webapp also has settings to make the tasks run automatically during build and publishing. This is why the build will fail if you don't have Node and Npm installed and setup as described above. If everything is installed and setup correctly, then the npm packages should get restored automatically when you first build the solution. If it fails, you can right click the Npm node under Dependencies in the web app and choose "Restore Packages". If that doesn't work for you you can try opening a command window in the root of the web app, and run the command npm install from the command window. If that doesn't work then something must have gone wrong with your installation, try a reboot. I'm using Ubuntu Linux 16.04 and I first installed the .NET Core SDK using the instructions for Ubuntu. See the introduction for details about using the project template to create projects. The main thing to know is that there are new options -W true will include the webpack setup when creating a project and -R true will include a sample react/redux app. Note that you can use the command line on windows as well, the instructions are the same except for the installation.